While making my new site section, wallpapers, I was contemplating using my webspace to host the wallpaper files but then decided against it for security reasons . 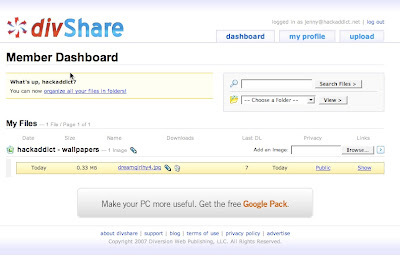 In comes DivShare. 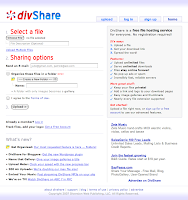 DivShare is a free file hosting service for everyone. No registration required! I signed up for an account last night and so far it looks pretty awesome. They have a neat file organization system and it's super simple to use. So far it's a great file sharing solution.